Anyone who has followed me from the Wanderly Wagons blog will know that my dog Cookie is somewhat special. Hyperactive, fixated on cats, a thief and a rogue, with no undestanding of “recall” whatsoever, so that on the occasions when she escapes, we have to resort to all sorts of measures to catch her again. The LSH was telling a dog-breeding work colleague some of her escapades recently, and he asked what her breeding was. 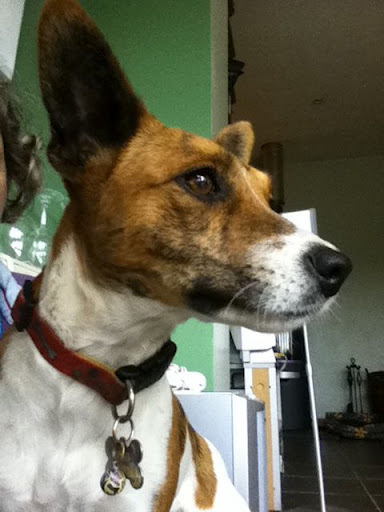 On hearing that we think she’s a Jack Russell/Whippet cross, he laughed until he almost cried…. “Why would anyone cross the most tenacious breed with the most hyperactive breed?” he asked. “That would be just like having a Jack Russell on speed!” and in fact, that’s exactly how I described Cookie nearly a year ago in this post. Still, we love her, she’s ours for the long haul. We think her life will be brief but intense, and will probably end as the result of a successful escape attempt or from eating something she shouldn’t. When we first took her in, we had no idea just how naughty she could be, until I came into the kitchen one day and found her standing on the table helping herself to breakfast leftovers. We agreed that she could not be trusted, so we should always make sure not to leave food out where she could reach it. Unfortunately, we’re not the world’s tidiest people, so the inevitable happened – we both left the room “just for a moment” one evening and came back to find Cookie licking the last traces off a wrapper which only moments before had been enfolding an almost untouched pound of butter. Oh dear, we said. She burped gently while we stood looking at her. This won’t be pretty, we agreed. How long will it take to work its way through, we wondered. Half an hour? An hour? We compromised on forty minutes, the LSH set the timer on his phone, and we sat down to watch something on TV, Cookie and Cinnamon curled up in their beds nearby. At thirty-eight minutes, Cookie sat up, licking her lips and looking anxious. We leapt to our feet, but too late – with a yawn and a cough, a large quantity of melted butter appeared in her bed. By the time the leash was clipped to her collar and she had reached the patio door, ten feet away, the floor (tiled, thankfully) was decorated with pools of melted butter. The LSH walked her around the garden for ten minutes, but it was too late, the full pound of butter had already been distributed between her bed and the patio door. A couple of months later, I was home alone. I’d had my breakfast, but hadn’t cleared off the table yet, when the postman knocked at the back door. I went out, signed for a package and came back, just as Cookie finished licking out the butter dish, which only moments before had held about three quarters of a pound of butter. At least she knew she’d been naughty this time, she leaped from the table, looking guilty, and scuttled furtively back to her bed. Ok, I thought, I’ll give it half an hour and take her out then. Thirty minutes later, I clipped her leash on and off we went. I’ll just keep walking ’til she throws up, I thought. Shouldn’t be long, ten minutes at most. Two miles later, I stopped and looked down at her. Ears pricked, tail wagging, tongue hanging out, she looked back at me. You’re not going to puke, are you, I said. We turned around and headed homewards. As we turned left to rejoin the road which leads to our house, I glanced to the right and saw a stranger walking towards us, about 30 yards away. We would both be heading in the same direction. Just as I thought “Well I hope she doesn’t puke in front of this guy” there was a cough and a choking noise from beside my feet, and Cookie spat out a large quantity of melted butter and Royal Canin Mini Mature kibble. Well, maybe that’s all she’ll do, I thought. Nope. For the next ten minutes, we’d walk a bit, stop, Cookie would spray the road and we’d continue. The stranger got closer and closer, but didn’t actually catch up with us. What was he thinking of us, as we walked along, mere yards in front of him, decorating the country road with partially digested kibble floating in pools of greasy, yellow bile. Finally, as Cookie barfed yet again, this time in front of our neighbours’ house, he caught up with us. Hello, I said, fixing a pleasant smile on my face and trying to act as if there was nothing unusual about strolling along with a dog which was shooting melted butter out the front end. He smiled grimly and headed for my neighbours’ gate. Hell!!! This was my neighbours’ son, visiting from the US! In fairness to him, he laughed then. It was only much later, when I was speaking to his mother, that I learned he’s one of those people who can’t bear the sight or smell of vomit, and had been thoroughly sickened by the trail of puke he’d had to follow home. She sounds exactly like Cookie, except she's trying to eat the cat's food, not the cat!Why would anyone WANT a dog like this???? We must be crazy! Oh yuck!Cookie sounds like a blast! A very tiring blast!